The Tunago Pacific Longline Tuna Fishery has proudly entered a Fisheries Improvement Project (FIP) with the aim to achieve Marine Stewardship Council (MSC) certification by 2023. FIPs bring together multiple fishery stakeholders; fishers, managers, researchers, funders and NGOs with the aim to improve a fishery’s practices and management against tools developed by the MSC to identify and track areas for improvement for the fishery to meet the MSC standard. 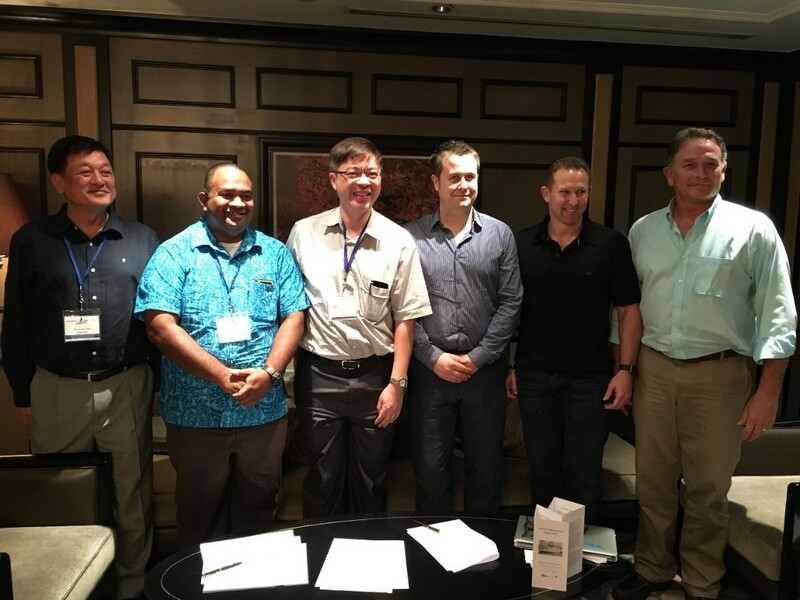 The Fishery Improvement Project’s participants formally signed the Memorandum of Understanding (MoU) and are; Tunago, Thai Union, The Nature Conservancy (TNC) and the Vanuatu Fishing Authority. Fishery consultancy company Key Traceability coordinates the FIP on behalf of the participants. Together the participants will work on implementing the work plan, which outlines the major activities, improvement areas, course of action and key performance indicators that all participants will have to commit to achieve within the five year timeframe of the FIP. The Tunago Pacific Tuna Longline Fishery aims to meet the rising global demand for tuna in a sustainable manner by assuring catches do not exceed sustainable levels, promoting the ecosystem based approach to fisheries management and strengthening policy and governance systems in the region. Special consideration will be invested in improving the availability of accurate data on catches, retained and especially bycatch and to collaborate with other institutions working on tuna fisheries issues in the country, including working together to improve the management and policy towards sustainable fisheries, for example Harvest Control Rules. The Tunago Fishery proudly joins with world leading tuna company, Thai Union, to make a commitment together to ensure fish resources will be sustainable for our next generation. Stephen Lo of Tunago said, ‘We are delighted to work with a professional team including Thai Union, TNC and Key Traceability to facilitate us throughout this journey. We welcome other fisheries to join us in our mission to achieve MSC certification making sustainability the norm, not the exception’. “FIPs are vital to bring all of the world’s fisheries up to standards of MSC certification, which is globally recognized as the best guarantee of sustainability. In line with Thai Union’s sustainable development strategy, SeaChange, we have committed to sourcing 100 percent of our branded tuna from fisheries that are either MSC certified or engaged in FIPs to move them toward MSC certification” said Francisco Leotte, Thai Union’s Sustainability Manager. “As one of the largest seafood companies in the world, Thai Union has fully embraced our role as a leader for positive change. This means putting sustainability at the heart of our business”. For further information, our Fishery Progress profile can be viewed here, containing the fisheries MoU, workplan, pre-assessment etc to be viewed. To register interest as a stakeholder, email info@keytraceability.com. Lauren Purton is the Social & Systems Manager at Key Traceability. She has conducted traceability, IUU, and social audits in sites around the Pacific. As well as reviewing management systems, Lauren developed and implemented the company’s own ISO 9001 Quality Management System, achieving certification in March 2018. In her spare time, Lauren plays American football for a local team. Lauren is based in Belfast, Northern Ireland. Ms.Haddi Imane is new to the Key Traceability team, as a consultant. Imane is currently undertaking a PhD, she is studying management of exploitable coastal resources. She speaks different languages such as Arabic, French, English and Spanish. In her spare time, she likes practicing scuba diving. Imane is based in Casablanca, Morocco. Hao Mai is a team member at Key Traceability. He graduated from University of Sussex in MSc Science & Technology Policy and has experience on fishery traceability and social labour conditions on fishing vessels, especially within the tuna supply chain. He also has industrial experience in cold storage and logistics. Hao is based in Kaohsiung, Taiwan and can speak fluent English and Mandarin Chinese. In his spare time, Hao enjoys scuba diving and badminton. Lia Hayman, recently joined Key Traceability as a consultant. Lia recently graduated from University of Portsmouth in BA (Hons) European Studies and International Relations. In her spare time, Lia is a member of Southsea yoga. Based in Portsmouth, England, Lia is also the Quality Manager at Key Traceability. Tom is the Science Manager at Key Traceability with extensive knowledge of MSC, ASC and IFFO RS standards. Tom works mainly on Fishery Improvement Projects around the world acting as the project lead to ensure fisheries meet certification. Tom is based in London, England and in his spare time enjoys rugby, music and food! Iain is a seafood consultant with extensive experience, having worked for authorities, NGOs and the private sector over a 16-year career in fisheries and aquaculture. Clientele include the MSC, ASC, MRAG, European Commission, FAO, Fairtrade and Sustainable Fisheries Partnership. His experience has included advising retailers and major brands on sustainability solutions, setting up and running FIPs, certifying and social accountability auditing. Iain’s spare time is mostly taken up by his kids but when there’s an opportunity he likes running and kickboxing.